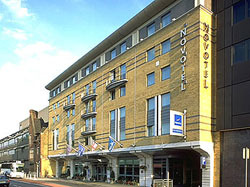 Upper mid market hotel with brand new 4 star Novation bedrooms. This hotel is located right opposite Big Ben and Westminster, just a 3 minute drive from Waterloo Eurostar Station, close to The London Eye, theatres, shopping & nightlife. 187 spacious, modern bedrooms, a Garden Brasserie restaurant serving international cuisine, The Flag & Whistle traditional English pub, a fitness centre with gym, sauna and steam room, meeting facilities, WiFi wireless Internet access and on site parking.